Pres. Bush placed called to U.S. troops on Thursday morning. WASHINGTON (CNN) – In keeping with what has become a holiday tradition, President Bush called 11 U.S. troops stationed around the globe to wish them a Happy Thanksgiving and thank them for their service, the White House said Thursday. Bush is spending Thanksgiving at Camp David and will have holiday dinner at the presidential retreat. He should apologize for starting his unnecessary "personal war" and wasting so many of our best and bravest lives in Iraq while the real threat to America still runs free.I hope he gets ptomaine poisioning and sprnds the afternoon on the othe throne. 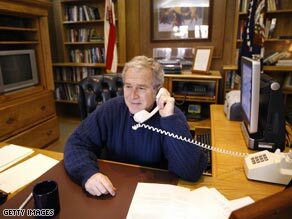 Guess there's no call display at camp David – that's one old telephone!! Lovely to know what the president will be eating for dinner tonight is newsworthy. Think it'd be newsworthy to tell us what he'll be taking for his indigestion afterwards? I'll be the first to tell you I think this guy is a disgrace to our country and should posses no power where any sort of authority to control anything that has to do with humans. However, I'm sure he knows how to live.. That's right W... get it in, It's Thanksgiving.. I pray that our Sons and Daughters will come home soon and that the whole world will know love and peace for one another as we move through these troubled times. Help the world to know that war is Not the Creator's plan for Human Beings. War and Hate is a human drive not a Divine one. May the Creator forgive our collective ignorance of His/Her/It's Divine Will for Humanity. May we find love and peace in our hearts and come together to solve the problems of the world instead of killing one another. "Pumpkin Pie with Whipped Topping? Cool Whip? Whipped margarine sweetened with corn syrup?